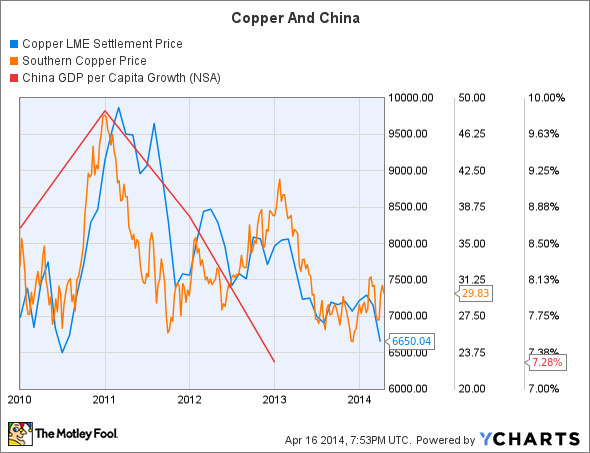 The copper market is uneasy. Prices are falling, and worries about China's slowdown continue. In the midst of this instability, it is necessary to go back to the basics. Compared to its peers, Southern Copper has low costs and is in a strong position to profit over the long run. China's per capita GDP growth rate is falling, but it is important to take this in context. According to the World Bank, China's 2012 per capita GDP of $6,091 is still significantly lower than America's per capita 2012 GDP of $51,749. The Middle Kingdom still has significant room to grow. The demand side of the equation looks relativity stable. The bigger issue comes from the number of new copper supplies that have been found in recent years. In 2000, the world had a copper reserves-to-production ratio of 26. In 2013, it had a reserves-to-production ratio of 39. Such a big increase in the ratio of reserves to production is frightening, but the reality is that the industry is just returning to its post-World War II norm. The average ratio of reserves-to-production based on data taken from 1950 to 2010 is 40.8. In other words, we have returned to the long-run average, not to a position of extreme oversupply. Supply constraints are loosening, making for a new world where cost is very important. Producers with lower costs will be able to maintain their production, but higher costs producers may be forced to shut down their mines to bring global production in line with consumption. The median point of the 2013 copper cost curve after by-product credits is estimated to be around $1.58 per pound. This means that producers below $1.58 have little reason to sweat price movements. Southern Copper is one of the best pure copper plays, and it really shines through on the cost side. Its 2013 unit net cash cost including by-product credits was $1.00 per pound, placing it far below the $1.58 per pound industry midpoint. In 2014, management expects cash costs before by-product credits should only increase slightly, thanks in part to low-cost production from Buenavista's SXEW III project. Southern Copper's 2013 earnings did take a hit, but its profit margin is still a healthy 27.3%. Its profits may be somewhat volatile over the next decade as the ratio of reserves-to-production has already returned to its long term average, but Southern Copper's cost advantage will remain. Freeport-McMoRan is a big copper player with higher costs. In 2013, its unit net cash cost per pound after by-product credits was $1.49, very close to the industry average. Being average is not inherently bad, but Freeport's copper operations still lack some of Southern Copper's cost advantages. At the same time, Freeport's oil and gas operations are very profitable and are expected to provide 27% of its 2014 EBITDA. Its oil and gas segment is focused on U.S. onshore operations, weighting Freeport's earnings away from China. This company is a good example of Buffett's mantra of finding a good business at a reasonable price. While its costs could be lower, at a price-to-earnings ratio around 13 Freeport-McMoRan is very attractive. Teck Resources is higher up on the cost curve. In the fourth quarter of 2013, its unit costs per pound after by-product credits were $1.57. In 2014 management expects that they will fall between $1.70 and $1.90. With copper accounting for 43% of Teck's fourth quarter 2013 gross profit, rising copper costs will have a big impact on its bottom line. Given Teck's higher costs, its valuation looks somewhat expensive. Southern Copper is trading at a price-to-earnings ratio around 16 and Teck trading at a slightly lower price-to-earnings ratio of 15. Teck's relatively low total debt-to-equity ratio of 0.40 is reassuring, but its 2014 earnings could take a big hit if soft copper prices continue and its costs rise as expected. Vale is a huge Brazilian miner that is suffering from falling commodity prices. At 76% of its 2013 adjusted EBITDA, iron ore is by far Vale's biggest challenge. Big increases in Australian iron ore output coupled with fears of soft Chinese demand is putting downward pressure on Vale's profits and forcing the company to find growth in other markets. In an effort to diversify and maintain profits Vale is turning to copper, and its $4.2 billion Salobo project is very promising. The start-up of Phase II is expected this year. The mine is a great move for Vale as its cash costs are projected to fall in the first quartile of global 2017 production. At the end of the day a promising company needs to maintain a handle on costs. Southern Copper's low cost position means that even if the copper market enters a serious downturn, Southern Copper will remain one of the stronger miners. In the realm of more diversified producers, Freeport-McMoRan outshines Teck Resources. Teck has higher copper cash costs and yet Freeport trades at a lower valuation. The article Fundamentally, Southern Copper Corp Is Promising originally appeared on Fool.com. Joshua Bondy has no position in any stocks mentioned. The Motley Fool owns shares of Companhia Vale Ads and Freeport-McMoRan Copper & Gold. Try any of our Foolish newsletter services free for 30 days. We Fools may not all hold the same opinions, but we all believe that considering a diverse range of insights makes us better investors. The Motley Fool has a disclosure policy.